Monica was a fabulous guide. 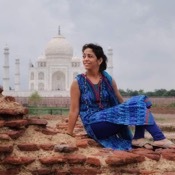 On meeting her initially she had pre booked our tickets to the Taj Mahal saving time. Her knowledge was excellent. She spoke very good english and took time to ensure we understood her descriptions and information. Monica was happy to take us 'off piste' away from the tourist sites so that we could experience the 'Real India'. We will be recommending her to our friends that intend to travel around Rajasthan.